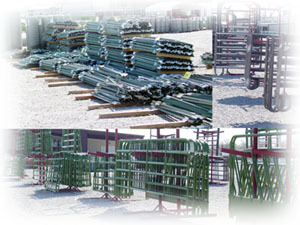 With over 2 acres of fencing inventory, BIG R can fill even the largest fencing orders the day you need it! Our volume buying combines competitive pricing with quality products. Our knowledgeable staff can help you with T-Post, wood driving post, barb wire, welded wire, field fence, horse fence, wire panels, railroad ties, chain link fence and electric fence and chargers. Come and visit our Fencing Department today! BIG R serves the ranch and farming community! That's why we stock a huge selection of horse and cattle panels, gates, squeeze chutes, calving tables, feed bunks and stock tanks in our drive through yards. Our volume buying allows us to maintain the most competitive pricing! Everything in our yard is clearly priced, so you don't have to ask! Come see why so many people shop BIG R for livestock equipment! If you have specialized needs, or need large direct deliveries, call our purchasing department at 775-423-8959 between the hours of 8am to 5 pm Monday thru Friday, or contact the stores directly. Big R Burns, OR 541-573-2024 Store Hours 7:30am to 6pm Monday to Saturday. Sunday 9am to 5pm. Big R Fallon, NV 775-423-2447 Store Hours 7am to 7pm Monday to Friday 7am to 6pm Saturday and Sunday. Big R Winnemucca, NV 775-623-2447 Store Hours 7am to 7 pm Monday to Saturday. Sunday 7am to 6pm. Big R Lovelock, NV 775-273-2687 Store Hours 8am to 6pm Monday to Friday. Saturday 8am to 5pm. Sunday 10am to 4pm.